Your Grace is Sufficient: Do you believe in Miracles? One problem we face in understanding Scripture stems from our false sense of familiarity; the shock value is naturally lost on the familiar. This is what has happened to the story of Jesus feeding the five thousand. But let’s try to read the story as if we were hearing it for the first time. Better still, let’s imagine ourselves as one of Jesus’ disciples, and experience the feeling of shock and incredulity on hearing the request (or was it more of an impossible demand) made by Jesus. The simplistic solution of Jesus to feed the multitude of five thousand with only a meagre ration must have been perplexing. Do the maths! You don’t have to be a genius to know that this is humanly impossible. And so it was quite natural for the disciples to express their perplexity at the logistics of Jesus’ food division. No way will this plan work. Perhaps, we who often style ourselves as modern sophisticated folks will be quick to deny that we actually believe in nonsense like miracles. A whole movement arose among Biblical scholars, about a century ago, to explain away the miracles of the Bible. 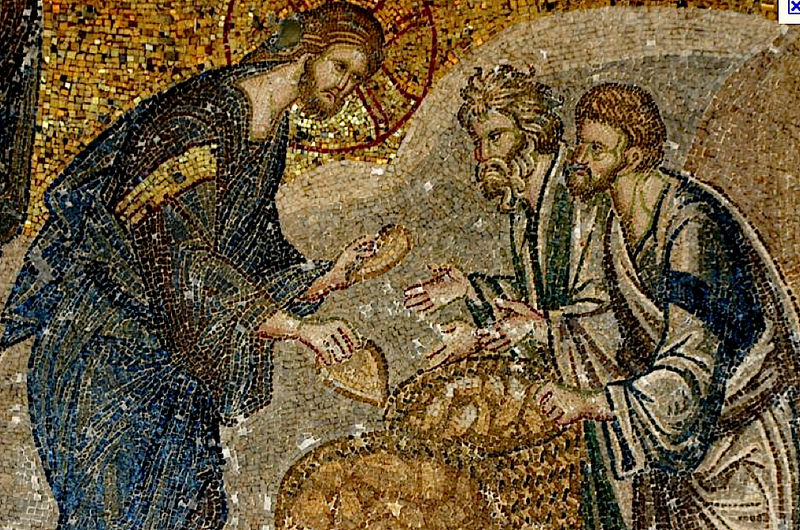 In this case, they decided, Jesus didn’t really feed the five thousand with five loaves and two fishes. That couldn’t have actually happened. Thus, a common approach for preachers would be to say that what probably happened was that the disciples took those bits of food out into the crowd, and the crowd was so inspired by Jesus’ words and the action of the disciples that they began to take out the food that any sensible person would have brought with them when you go into the desert, and they began to divide it up amongst themselves. And so, after everyone shared their food with each other, there was more than enough for everybody. That’s much more plausible than this pleasant fairy tale about a miraculous multiplication. If this indeed is the proper interpretation of the above story, then the virtue that should be emulated is that of generous giving and sharing. There is nothing wrong about generosity. In fact, generosity is a much needed virtue. Most parishes, including this, could do with a little more generosity from its parishes. However, this point misses the mark by a long shot. Notice that Jesus doesn’t argue with the disciples about the scarcity of food nor does he reprimand them for their selfishness. Facts are facts. Five loaves and two fish are visibly limited resources when considering the needs of five thousand. And in a way the disciples were right. The way the real world works is much more about division and subtraction rather than multiplication. The entire field of Economics exists to address that problem: how best to divide up, allocate, and use those limited resources, and it permeates our lives in countless ways. But, here the problem isn’t about economics, nor is it about our lack of generosity, nor even the little supply of resources. The real problem is faith, or rather their little faith in what Jesus can do. In our modern, sophisticated, and scientifically rooted world, claims of miracles are often distrusted and treated as either ravings of the mad or the primitively superstitious or just another phenomenon that has temporarily not received a logical and scientific explanation yet. The word "miracle" comes from the Latin word for wonder and, literally means "a sight to behold." Thus its usage in common speech often signifies the wondrous, the improbable, or the newly discovered. Sometimes people tend to refer to natural events such as the sunrise, seasons, birth, and coincidence as “miracles.” Likewise, we also speak of the miracle of modern medicine, science, or technology. Many of these items are in some way wondrous. But to apply the term "miracle" to any of these, however, is to omit the most distinctive feature of a miracle: God's direct intervention in the world. God has not abandoned us! More accurately and traditionally understood, a miracle is a supernatural or a preternatural sign or wonder, brought about by God, signifying His glory and the salvation of mankind. It is a call to faith. As a sign, a miracle is perceived by the senses and makes present the supernatural order, God's governance of nature, and His loving plan of salvation. A miracle of grace, such as a sudden conversion of a notoriously evil man, would be a supernatural miracle because, even though the act of conversion is invisible, it manifested by visible acts. All other miracles are divine interferences with the physical laws of nature. They are preternatural, which means beyond nature, and visible. Matters of faith, such as Our Lord’s presence in the Blessed Sacrament, are a mystery, not a miracle in the strict sense, because the reality is not visible to the human eye. Miracles ultimately point to how God acts in our lives. Jesus Christ, the Word made flesh, is Himself God's revelation. The most fundamental miracle is therefore the Incarnation. All of salvation is rooted in the Incarnation, and so it is with miracles. It may be said that the Incarnation is the "miracle of miracles." Through the Incarnation, the Invisible Deity is made Visible. While the Incarnation is the root miracle of salvation, the Resurrection is the definitive and ultimate sign of Christ's divine authority. It is clear that those who consistently reject the possibility of miracles will often end up demythologising both the Incarnation and the Resurrection – that is, that God didn’t really become man, nor did Jesus really rise from the dead. For the skeptics, the Incarnation and the Paschal Mystery are all part of the Christian myth, together with miracles and a whole load of other nonsense. Thus our belief in miracles of Christ ultimately affirms his divinity. Christ performed these miracles not just to dazzle us with the spectacular. A magician or an artist could easily do the same. Rather, miracles will always have as their primary purpose the glorification of God and the calling of people to salvation. The signs worked by Jesus attest to His divine authority and invite belief in Him. They were signs of the Kingdom of God breaking into our world. After His Ascension and Pentecost, Christ's disciples worked miracles in the name of Christ, thus giving the people signs of His divinity and proofs that He is who they said He is. In the same way later saints worked miracles to testify to a higher authority and that people are called to His kingdom. Miracles aren’t about altering or defying reality. On the contrary, miracles point to the “heart of reality” – to the way things are supposed to be in overcoming the way things are; which is always pretty surprising when we think “the way things are” is all that there is. Where we see scarcity God sees abundance. When we see dead ends, God sees beginnings. When we see the failure of sin, God sees the victory of redemption. And so those scholars who want to rationalise miracles are missing the whole point. Miracles are done to show, not simply tell, that God’s abundance is more real than the world’s scarcity; that God’s love is more real than the world’s brokenness; that God’s reconciling, vivifying, multiplying grace is more real than the world’s division and subtraction. Miracles, in expounding the power of grace over the limitations of nature, remind us that a marriage has not failed just because we have exhausted all human efforts at reconciliation. Where there is still faith, and hope and charity, there is the power of grace that brings healing and forgiveness to even the most impossible of situations. In an age of science, we need to reaffirm our belief in miracles. We, of course, do not go in search of them, for what is contingently good ceases to be so, when it is desired for itself without reference to the Ultimate Good, which is God. God is the author of miracles and it is He who must decide when a miracle is deigned necessary. Miracles are never meant to distract us from God. Rather, their essential purpose is to indicate that the human person is destined and called to the kingdom of God. Instead of insatiably hunting for the miracles of God, we should refocus our attention in searching for the God who stands behind those miracles. And in our single-hearted search for God and his will, He sometimes deigned it proper to reveal a miracle to strengthen our resolve and spur us on to greater heights. Miracles therefore act as signposts pointing the way that we need to take, reassuring us of God’s presence especially in moments of doubt, and finally, breathing new excitement into our faith. These signs therefore confirm in different ages and in the most varied circumstances the truth of the Gospel, and demonstrate the saving power of Christ who does not cease to call people on the path of faith. By contemplating these special graces, it is hope that we may come to love and recognise him daily in the ordinary situations and seasons of life where God is most certainly present and alive!